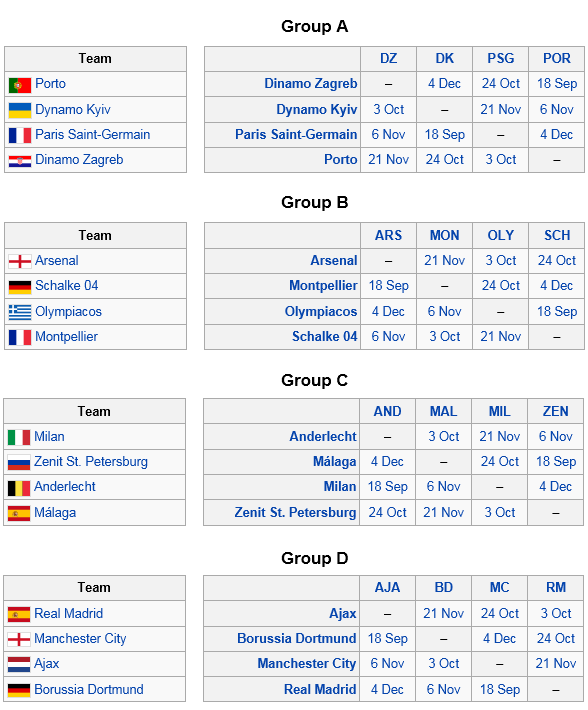 The UEFA Champions League draw was made yesterday (Thursday) in Monaco, and as usual many still think that the draw was fixed. What a cry baby. It was shown LIVE on TV and you can see the person mixing the balls around randomly before picking one of the them without being able to have a glance. So, just leave the probability law do the job, shall we. English teams Manchester United and Arsenal got pretty straight forward draws while it's a tricky one for depending champions, Chelsea with Juventus in the same group. High spending Manchester City is in the "group of death" together with Real Madrid, Borussia Dortmund and Ajax. Sir Alex Ferguson has reportedly (ESPN) told his Manchester United players they cannot afford to make the "stupid errors" they committed in during the group stage of the prestigious UEFA Champions League last season. 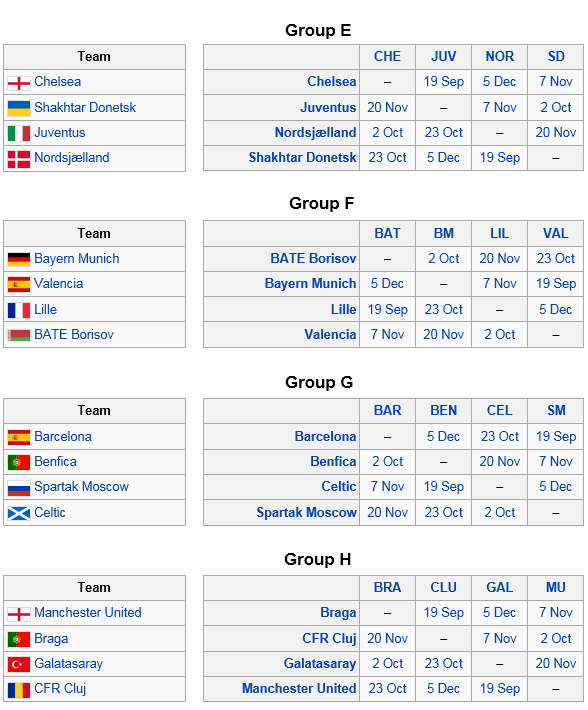 With the relatively easy CL group, United should qualify for the knockout stages of the competition with ease. They just need to remind themselves of the poor home display last season to drive them to perform better this time around. Come on! No more soft goals and lapses in defense. With the addition of another world class striker in Robin van Persie, United's arsenal should have more than enough armour and bullets. Note: Manchester United's first game is against Galatasaray at Old Trafford on 19/09/2012. I wonder when Liverpool can come back. @rainfield61 - while i'm not a fan of Liverpool, I sometimes feel sorry for the state they are in during the last few seasons. @tehr - dua hari lalu, MU menang dgn dramatik sekali lwn Southampton. Puas hati dgn jaringan hatrik Robin van Persie. Another nervous moment for United as they trailed by 2 goals before completing a turnaround. United leave it late to secure the points! United's first defeat in the campaign, but they are already through to the next stage and Alex Ferguson played his second strings. Cluj stunned United at home. But at this stage United have already qualify for the next round as the Group winners. M.United is drawn to meet Real Madrid in the knock out stage. Let's see how they fare this time. Last time United went down on aggregate although they won the 2nd leg tie at Old Trafford. Wellbeck scored for United and Ronaldo (ex-United hero) scored for Real. Van Persie had a golden opportunity to seal an away win with only the goal keeper to beat at point blank, but he mis-cued the ball. It's the end of the road for United as far as Champions League is concerned. They are out of the competition. Things changed after Nani was controversially sent off early in the 2nd half, a blunder by the referee. United were leading 1-0 then. Try again next season. Go go United!